Despite the inevitable frugalities of post-war Britain, the period from 1946 and well into the 1950s saw significant changes in social thinking and priorities within the context of post-war reconstruction. The post-war government established the National Health Service in 1948 and new housing developments went ahead to replace bombed homes and the inadequacies of pre-war housing. The 1947 Town & Country Planning Act and the New Towns Commission were significant milestones in planning the needs of communities. New Towns were planned under the powers of the New Towns Act 1946 and later Acts relocated people because of the Second World War, or addressed ‘overspill’ from heavily populated or deprived areas. Some towns were not completely new and were developed around older towns. The years immediately following the Second World War saw very limited growth in the development of sport and recreation facilities in Britain. Costly swimming pools and indoor sports facilities could not be afforded against other more immediate issues in the post-war period. The first wave of New Towns beyond the Green Belt around London was intended to help alleviate the housing shortages following the Second World War. There was also one new town in Scotland and one in Wales. Two sites in County Durham were also designated to help relieve housing shortages in the industrial north-east. Much later, in 1967, a New Town of Milton Keynes was also designated. The New Town absorbed the existing towns of Bletchley (which was to become famous for the first centre with a leisure pool), Wolverton and Stony Stratford which are today constituent towns of Milton Keynes. Almost all the New Towns were to develop sports centres eventually, most in the 1970s or 1980s. The Ministry of Education’s Physical Training and Recreation Act in 1937 was an earlier, though not very satisfactory foundation for the provision of sports facilities, being based mainly on the fear that the general population was unfit for war. The Act provided for the development of facilities for, and the encouragement of, physical training and recreation, and was also to facilitate the establishment of centres for social activities. It represented a widening from a Victorian interest in public walks and pleasure grounds. The intentions were good. Local authorities could acquire land for facilities and clubs, with or without charge for their use. Wardens, teachers, and leaders could also be provided and local authorities could contribute for expenses incurred by voluntary organisations. The Act was the first to use the word ‘recreation’, on the grounds of social and physical health and welfare and character training. Denis Molyneux, of Birmingham University, observed that the Act left one in no doubt that the accent was much more on physical training than on recreation. However, the Act was to achieve very little, not least because of the subsequent World War. In looking at the roots of the emerging thinking about sport, the role of the government and the place of ‘community’ at that time, Birmingham University’s Physical Education (PE) Department was a prime mover, especially for research-based analysis. Birmingham University was to the fore by the 1950s, being the first university to accept PE as an academic discipline and offer a degree in PE in 1946. It sat alongside the long established, leading specialist PE teacher training colleges of Loughborough, Leeds Carnegie, Bedford, Chelsea and others. Birmingham’s Physical Education Department was led by David Munrow. David was a pioneer and was appointed as the first Director of Physical Education at Birmingham University in 1939 by the Vice-Chancellor, Sir Raymond Priestley (1886-1974). 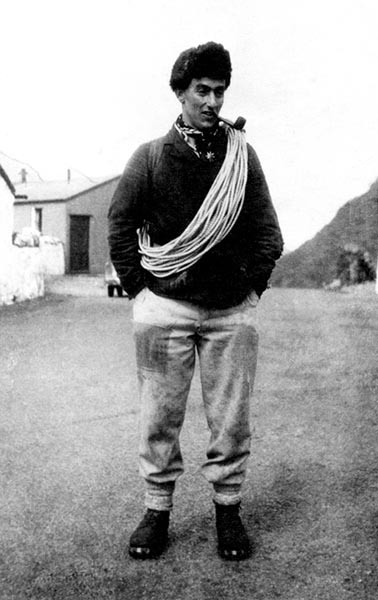 Priestley was also a celebrated Antarctic explorer and researcher from the Scott and Shackleton expeditions. Priestley brought physical education, recreation, and health into the life of the student and staff community. The influence of physical education and its luminaries in the 1950s cannot be over-estimated. Most of the earliest centre managers in the 1960s and 1970s came from a physical education background. However much less is known about the influence of physical education, and Birmingham University in particular, on sport and indoor provision and on the government’s attitude to sport in the 1960s. In the period from the 1950s until the late 1960s, Munrow, together with his Deputy from 1946-59, Peter McIntosh (later Senior Inspector at the Inner London Education Authority), and University lecturer and researcher, Denis Molyneux, were very practical academics. They were to have a significant influence on the education, sporting and political scene and were extremely active on behalf of sport and the case for indoor facilities. In the 1950s and early 1960s these three University lecturers were also amongst the most prominent sports lobbyists in the world. In 1961 Munrow spoke on ‘Sports Training in Great Britain’ at the International Olympic Academy in Olympia, Greece. 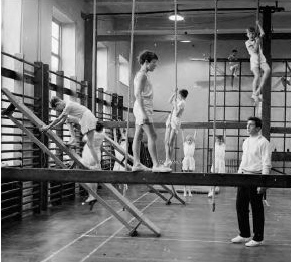 UK PE students were also familiar with a standard text – ‘Pure and Applied Gymnastics’ – a book written by Munrow in 1963. Later Munrow was a member of the Wolfenden Committee, and both Munrow and McIntosh served on the new Sports Council from 1966-1974 and Denis Molyneux was also seconded to its staff. Subsequently Birmingham University designated the ‘David Munrow Sports Centre’ to honour his work. The history of community sports halls and centres in the UK is relatively short and dates back to the experimental projects explored in schools during the late 1950s when attempts were first made to widen the PE curriculum. For many years, in schools, the traditional 18 x 12m gymnasium had been an obvious constraint to the teaching of basketball, netball, and many other activities introduced at that time. 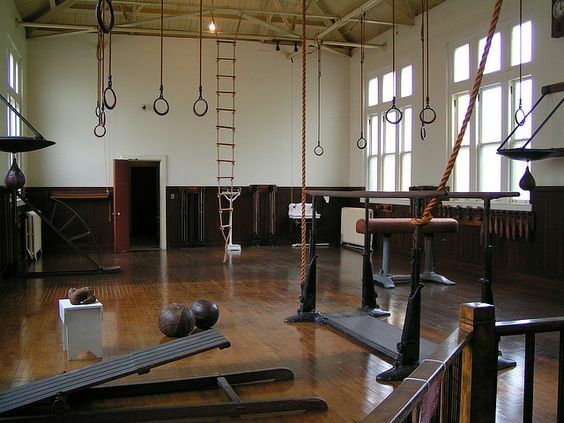 Larger school rolls meant it was not long before some of the more adventurous authorities had built larger alternative indoor solutions, within the regulated pupil/space calculations that applied for gymnasia. 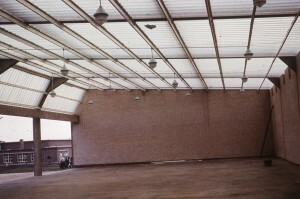 This facilitated some of the first conventional sports halls on school sites. Against the post-war Welfare State backcloth, three areas of activity were therefore to predominate over the sports scene in the early 1960s. First were the discussions and reports around physical education and sport in schools. Second was the attitude of the Youth Service to sport. The third, and by far the most significant, was the lobbying of the CCPR and the publication and impact of the Wolfenden Report. In the 1945-1964 period, as before the war, there was no government ‘sport’ policy as such. The national organisations most concerned with sport until the early 1960s were the Central Council for Physical Recreation (CCPR), now Sport & Recreation Alliance, and the National Playing Fields Association (NPFA). In 1957, the CCPR appointed a small independent committee, under the chairmanship of Sir John Wolfenden, Vice-Chancellor of Reading University, to examine the general position of sport in this country and recommend what action should be taken by statutory and voluntary bodies if games, sports, and outdoor activities were to play their full part in promoting the general welfare of the community. The CCPR worked in England, Wales, and Northern Ireland, but with the support of the Scottish Council for Physical Recreation, the inquiry covered the whole of the United Kingdom. Though not a government review, it was taken by all as the most significant study to date of the national sports scene. 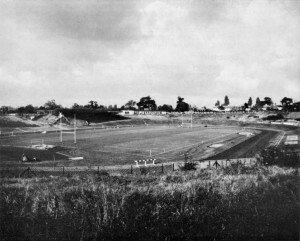 Post-war social thinking and developments through the 1950s provided a generally favourable climate for new sports centres. There was a need for sports halls to accommodate the burgeoning indoor sports (volleyball, basketball, badminton, indoor tennis, and handball) which were being encouraged by the CCPR at that time (and later by the Sports Council). However, it took the Wolfenden Report to start to shake the ground regarding sport and facility provision. There had not previously been any similar case for sport. There had been a slow acceptance of the benefits of recreation, but the argument for parliamentary recognition did not get underway until the Wolfenden Report in 1960. Whilst it was eventually to have a big influence on government thinking and support for sport, the initiative came from the CCPR. The Wolfenden Committee was appointed by the CCPR in October 1957 with the following terms of reference – “To examine the factors affecting the development of games, sports and outdoor activities in the United Kingdom and to make recommendations to the Central Council of Physical Recreation (CCPR) as to any practical measures which should be taken by statutory or voluntary bodies in order that these activities may play their full part in promoting the general welfare of the community”. Recognisable names from that era on the Wolfenden Committee included Jack (later Sir Jack) Longland (1905-1993) mountaineer, educationalist, broadcaster, and Vice-Chairman of the Sports Council 1966-74; and of course, David Munrow. Justin Evans MBE, Deputy Secretary of the CCPR, was secretary to the Committee. The greatest credit went to the Chairman, Sir John Wolfenden CBE (1906-1985), later Baron Wolfenden, whose chairing of the Committee and its processes was considered commendable. The committee held its first meeting in January 1958 and its working methods did much to enhance its status. In two years, it took evidence from hundreds of individuals and organisations, including all the major sports bodies. The Report of the Wolfenden Committee on Sport – ‘Sport & the Community’ was published in 1960 and became a benchmark for sport and community sports provision. Whilst the Wolfenden Committee was mainly concerned with physical recreation outside of school, the Wolfenden Report was to sit alongside or preface a range of other major reviews around that time into sporting, educational and social issues. One of its major proposals was to establish an independent “Sports Development Council” to oversee government policy on sport and to promote sport more widely. The Wolfenden Report was formally launched at a press conference in London on September 28th, 1960. Sir John was already conscious of concerns regarding the proposal to introduce a Sports Development Council. The Report was warmly welcomed by all sports enthusiasts. The first print run of 10,000 copies quickly ran out and 5,000 further copies were printed. It was widely reported favourably by numerous national publications including the Guardian, Daily Herald, Sunday Dispatch, Daily Telegraph, and Daily Mail. The special factors and problems examined by the Wolfenden Committee included the gap in the levels of participation in sport between school years and post school lives (this became ubiquitously known as the ‘Wolfenden Gap’). Facilities, coaching, organisation, administration and finance, amateurism, international sport, the press, television and radio, and Sunday games were also covered by this far-reaching report. There was a public perception that that there was lack of interest in sport on the part of the relevant government department at that time, the Ministry of Education, which had handled any grants arising from the 1937 Act. For the creation of a Sports Development Council to provide the basis for a constructive new approach to assessing appropriate provision for community sports grounds, swimming pools, sports halls, and other indoor facilities. To furnish the new Council with finance. Wolfenden not only recommended the establishment of a Sports Development Council but £5 million as the amount to be distributed in any one year. A figure of £5 million was also recommended as an annual sum to be sanctioned over and above existing permissions for capital expenditure by statutory bodies. The recommendation for a Sports Development Council proved to be the most contentious issue politically. For example, Phyllis Colson, the founder of the CCPR which had set up the Wolfenden Committee, lobbied aggressively against it, which in part explained the delay in implementing the proposal. It was not until after the retirement of Miss Colson and the appointment of Walter Winterbottom as her successor that any progress was made. “The most serious shortage of facilities is that for indoor games and sports. This can only be met by the action of local authorities or local education authorities. The erection of large barns would provide for many needs. The establishment of experimental multi-sports centres is recommended. The initiative in establishing them must come in the main from local authorities and local education authorities. such a centre at Harlow. However, as history reveals, such centres did not become common-place, not least because existing outdoor sites were not usually chosen for new indoor centres, which were often built on smaller sites nearer town centres. The exceptions were joint provision centres on school sites with playing fields. Nonetheless there are some excellent indoor/outdoor examples, not least Gosling Park at Welwyn Garden City, which first opened as an outdoor centre in 1959. A sports hall was not added until 1976. Wolfenden also raised the issue of local authorities combining to provide sports centres. This was a concept that did not take-off, not least because parochial attitudes prevailed. It was against the backcloth of a report as significant as Wolfenden, and other reports around that time, that politicians were expected to respond. Despite the general acceptance of the benefits of recreation and the previous enabling Act of 1937, many of the major proposals in the 1960s for sport, the arts, and the youth and community service were never fully introduced. In addition, in practical terms, local authorities and other providers had still to operate through a maze of acts or sections of old statutes. They also had to operate through a proliferation of government departments and the system allowed and almost encouraged separate policies, separate budgets and different attitudes and changing policies towards recreationists, particularly clubs. Important as the report was, the issues addressed by Wolfenden on the role of sport, funding and organisation had been reverberating during the 1950s. The Labour Party’s ‘Leisure for Living’ publication in 1959 pre-dated some of Wolfenden’s justifications and its call for facilities, including sufficient indoor provision. It was not until 1965, once out of office, that a Conservative paper on sport and leisure was prepared, by the Bow Group, under the chairmanship of Christopher Chataway MP, ‘A better country: a policy study on the use of leisure’. However, after Wolfenden, sport was no longer on the periphery of political debate. Debates on the report were held in the House of Lords in February 1961 and in the Commons in April. Justin Evans said the Wolfenden Report received a “very rare amount of attention, which no government could ignore”. Yet over the next four years political observers could be forgiven for thinking that Wolfenden was never going to be properly implemented. Macmillan’s government of the time gave it a cautious welcome. The government had kept its predecessors’ National Health Service and social security safety net in place, however significant support for sport seemed a bridge too far. The day after the Wolfenden press conference, the political scene was set by David Eccles, Minister of Education, writing to his Permanent Secretary, “I am anxious to prepare public opinion for a rejection of Wolfenden’s new Sports Council”. The Ministry of Education had taken a leading role on such matters previously and wasn’t about to see its role diminished. Ministers continued to adopt a non-committal stance. The Home Affairs Committee did not reject the Report, but agreed further study would be needed by officials. The political arguments around Wolfenden continued over the next few years, especially about the recommended funding and a Sports Council. The government seemed on a containment exercise and parliamentary motions indicated impatience with the government’s ‘evasive answers’. The British Olympic Association (BOA), NPFA and CCPR (after the appointment of Walter Winterbottom) all weighed in, asserting the need for funds and a new approach. The call for a sports council was heard in both the Commons and House of Lords debates. Throughout 1962 funding for sport and a sports council still dominated parliamentary debate. The economy being in the doldrums did not help the cause of sport. The case for a Sports Development Council, strongly as it was put, was not eventually justified by sport and recreation intrinsically, but rather by extrinsic factors, including Britain’s failures in international sport, a rising youth sub-culture and the moral qualities of sport that were claimed to be an antidote for unsocial behaviour. Wolfenden had also emphatically raised the question of government funding for sport. 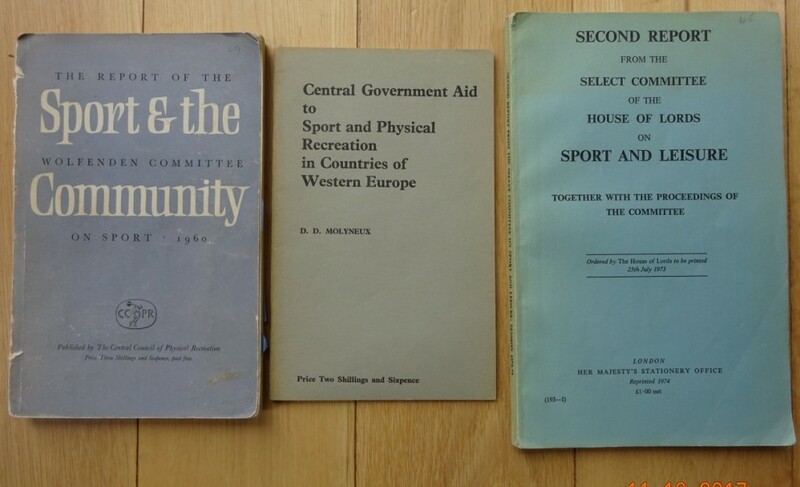 Denis Molyneux had been responsible for a research paper published by Birmingham University in 1962 – ‘Central Government Aid to Sport and Physical Recreation of Countries of Western Europe’. The paper highlighted the stark comparison of the level of funding for sport by other governments compared to the insignificant amount provided by the UK government. On the continent provision of facilities had been on a massive scale compared with that in the UK. Spending throughout Europe has been between twenty and twenty-five times that in the UK, with provision being made even in communities of 4000 or less. The latter often involved the use of community schools especially in country districts otherwise unable to fund large scale facilities themselves. In particular, first wave projects from the 1960 Golden Plan for West German sport and the later ‘mille piscines’ pools programme in France had been planned or implemented. The research paper to this day remains the single most persuasive influence on government involvement in sports funding. Indeed, Denis Howell MP, later to be Minister for Sport, waved the report in the House of Commons during one of his speeches in favour of Wolfenden during the long period of parliamentary argument. (Denis Molyneux donated his copy to this Project). In 1962, a co-ordinating role for sports issues was added to Lord Hailsham’s portfolio. Despite some minor, positive efforts under Hailsham, the Conservative government remained largely disinterested in sport and averse to a Sports Council. Arguments continued into the June 1964 Commons debate, which saw intense political argument, with Denis Howell MP to the fore in making the case for Wolfenden and a Sports Council. The answer probably lies in the attitude of the CCPR, the report’s originators; who were clearly disappointed and dismayed by its own Committee’s recommendations. As representatives of national governing bodies of sport and voluntary organisations, the CCPR had anticipated that Wolfenden would have favoured direct Government funding of sports bodies through the CCPR and the adoption of a continental, voluntary style of facility management. The suggestion of an intermediary “Sports Council” to channel funding to the CCPR and NGB’s as well as support for a community ownership and professional management model was anathema to the organisation and was vigorously opposed by its then General Secretary, Phyllis Colson, its patron the Duke of Edinburgh and Chair, Sir Stanley Rous. These Establishment figures lobbied consistently against the recommendations of its own committee creating ongoing conflicts between the CCPR and the emergent Sports Council. It was not until Miss Colson retired and was replaced by Walter Winterbottom and Denis Howell was appointed Minister with responsibility for sport that the Wolfenden model prevailed, leading directly to the growth of the publicly owned and professionally managed sports centres that we know today. This was a truly a transformational moment and the beginning of the unfolding story of the sports centre. Now, two decades into the next century, community sports and leisure centres are a ubiquitous factor of civic life, but this was not originally inevitable as other alternative models could have been preferred. The Education Act of 1944 was a major step forward in British society and enacted during the war and steered through Parliament by Education Minister ‘RAB’ Butler. Given the war context, it was a mixture of disillusion and aspiration. Historians consider it a “triumph for progressive reform,” and it did also provide a context for later education and sporting reviews and reports, including Wolfenden. The Education Act led to a re-organisation of school categories into grammar, technical and modern and the raising of the school leaving age to 15. It also put a requirement on local education authorities to provide adequate facilities for recreation and physical training, establishing physical education for its educational value. Between 1956 and 1967 several major reports related to education and physical recreation, including Molyneux’s publication, in effect book-ended Wolfenden’s ‘Sport & the Community’ Report. Possibly no ten-year period in the 20th century produced major reports with so much impact on the social, education or sporting scene than that decade. In 1956 a 70-page booklet -’Britain in the World of Sport’ (written by seven members of the Birmingham University PE Department) examined participation in competitive international sport but also referred to domestic issues including facilities. It stated that “the spread of sports such as basketball was being held back in Britain by a lack of indoor halls”. It highlighted that, by way of example, West Germany had built 47 public swimming baths (with 200 more planned) since the war. England had built just one. At the time ’Britain in the World of Sport’ [Physical Education Association of Great Britain and Northern Ireland -1956] was seen by the sports fraternity as a review of special significance. It was the first to raise the important potential for an advisory sports council. At that time, the report had little impact on politicians. However, it received a broad welcome within the sporting world and press coverage and led to proposals within the CCPR in 1957 for “an impartial body qualified to hear evidence and reach conclusions” on UK sporting issues. Thus, the Wolfenden Committee was born. The Albemarle Report into the Youth Service, also published in 1960, was viewed as a watershed in the history of youth work and is associated with the expansion and professionalization of youth work in the 1960s and 1970s. The Report was sparked by both the realities and the perceptions of a growing ‘youth problem’ at that time. Albemarle was unequivocal about the positive role of physical recreation. The Report was first to identify the ‘gap’ which it referred to as “the manifest gap-break between, on the one hand, the participation in recreative (sic) physical activities which is normal for boys and girls at school, and, on the other hand, their participation in similar (though not necessarily identical) activities some years later when they are more adult.” The phenomenon of the ‘gap’ had also been noted in the Crowther Report on 15-18 years full-time education, published in 1957. 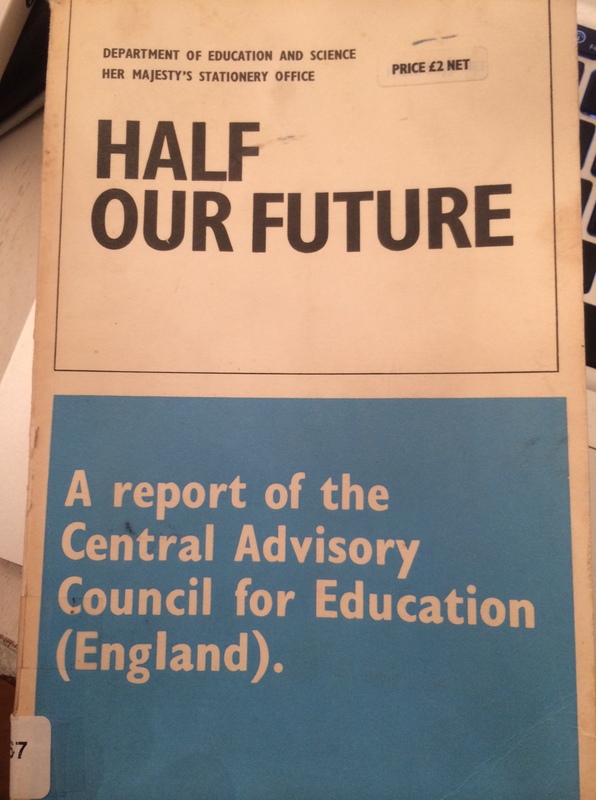 Later in 1963, as if to add power to the elbow, the Newsom Report, ‘Half Our Future’, into the education of 13-16-year-olds, was also concerned about the lack of facilities for physical education. The Robbins report into Higher Education in 1963 led to an expansion of universities. This enabled some universities to become amongst the first places to have a sports hall. 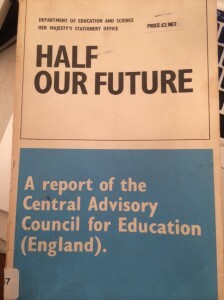 The decade of reviews related to education culminated in the Plowden Report – ‘Children and their Primary Schools’, which was published in 1967. Sadly, it made no reference to physical education or facilities. Some would say little has changed in most primary schools today as regards indoor facilities. Many of the reviews after Wolfenden lent weight to the argument for sport and indoor facilities being about both social and physical well-being. However, it was Wolfenden which laid the tracks for the future. “Automation, new sources of energy and the growing use of electronic calculating machines are beginning to transform almost all branches of our economic and social life. As these trends develop the importance of leisure will steadily increase. It is not the job of the Government to tell people how leisure should be used. But in a society where so many facilities are not provided because they are not profitable and where the trend towards monopoly, particularly in entertainment, is steadily growing, the Government has a duty to ensure that leisure facilities are provided and that reasonable range of choice is maintained”. Wilson declared the theme of his government was to be modernisation in his ‘white heat of technology’ speech in 1963, and leisure was to be the most modern of public sector service sectors in which to promote opportunities. Perhaps here was born the local authority leisure department and the concept of the widely provided public sports & leisure centre! Wilson felt that sport resonated well with Labour’s core constituency. In 1971 Wilson commented “Within the field of ministries already in existence, I appointed a number of junior ministers with special responsibilities for subjects essential to Britain’s economic and social development which had not been given an adequate priority in the past”. This had prompted him to appoint the energetic and popular former Football League referee, Denis Howell MP, to the Government. Howell was appointed as a junior minister at the Department of Education & Science with responsibility for schools and sport – the first-ever government post of ‘Minister for Sport’. In later years, he was a junior minister (still with his ‘sport’ hat), in Housing and then the Environment, which gave him access to the thinking of local government ministers, as well as being able to influence them. Howell always said, “I’m the Minister for Sport – even when we’re in opposition”. Denis Howell’s appointment was a truly a transformational moment and an important part of the beginning of the unfolding story of the sports centre. 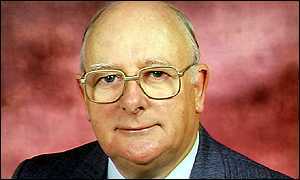 David Munrow and Denis Molyneux were well known to Denis Howell, as he was MP for Birmingham Small Heath. Molyneux and Munrow were staunch supporters of the Wolfenden recommendations and proposals to establish an advisory Sports Council. When Howell became Minister for Sport, it was to these two he turned for advice when given permission by Prime Minister Harold Wilson to set up the first advisory Sports Council. They proved important friends of, and advisors to Howell. Denis Molyneux, who had of course been responsible for the very important 1962 research paper on Government Aid in Western Europe, suggested to Howell a proposed structure for the Council, which was adopted. It was also Molyneux who urged Howell to chair the Council, which he duly did. Reflecting Wolfenden again, the years leading up to 1970 saw a variety of initiatives under the Wilson government of 1964-70 (and later from 1974-79). The role of school-based indoor sports facilities was first given importance in 1964. The Joint Circular [DES 11/64; Min. Hsg 49/64], ‘Provision of Facilities for Sport’ (Scottish Education Department Circular No. 550 ‘Facilities for Recreation’), had emphasised the desirability and better value for money of dual use (education and public) and the joint provision of facilities by two or more partner authorities. In 1966, the Ministry of Housing and Local Government Circular 31/66 ‘Public Expenditure: Miscellaneous Schemes’ also drew attention again to the savings which could be achieved by joint provision and the need for consultation with the new regional sports councils on new projects. The decade of the 1960s also saw a new field of research and documentation in sport, and, as we have seen, the Birmingham lecturers were again at the forefront of this activity after Wolfenden. 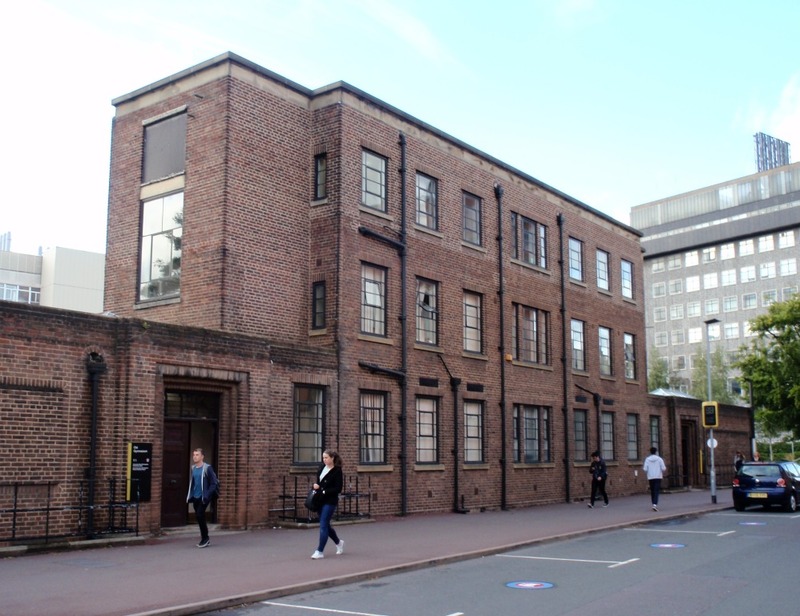 A National Documentation Centre for Sport, Physical Education, and Recreation (later University of Birmingham Sports Documentation Centre) was established in the late 1960s/early 1970s jointly by the Sports Council and the University of Birmingham, with weekday access. Other early influences on strategic thinking in provision for sport and leisure included ‘The Challenge of Leisure’ (the Fourth Wave) in 1965. This was a study and survey for the Civic Trust by Michael Dower of the Dartington Amenity Trust, and a member of the advisory Sports Council. It embraced all types of community leisure planning and provision. The publication was viewed as significant by the CCPR, at that time the leading national sports organisation. It also greatly influenced the early thinking and strategy of the subsequent Executive Sports Council established by Royal Charter, and which in 1972 took over the national ‘strategic lead’ for sport. Senior Sports Council officers of the time have highlighted the importance that the ‘Challenge of Leisure’ had on early thinking about the provision of sports facilities. One of the 12 conclusions in the publication from the survey work was: “The result is a fast growing and changing demand for leisure activities. Our towns and countryside do not match this demand. We need more spacious and adaptable homes, more sophisticated leisure buildings, more coherent open space, more accessible countryside, a better deal for tourists”. In July 1973, the imprimatur for the need for indoor provision was provided by the ‘Second Report from the Select Committee of the House of Lords on Sport and Leisure’, stating, in support, “The Committee believe that the demand for facilities certainly justifies the Sport for All campaign, and a national effort to remedy the shortfall of sports facilities”. Dower, and others, had reflected a period of optimism that assumed leisure might be a ‘social good’. This was reflected in the House of Lords Report and by Denis Howell in the 1975 White Paper ‘Sport and Recreation’. These provided additional impetus to the great expansion of provision that was to follow. When the advisory Sports Council was first established by the Wilson Labour Government in 1965, Walter Winterbottom, former England soccer manager and General Secretary of the CCPR, was seconded to be Director. Recognising his wisdom and work, Denis Molyneux was seconded from Birmingham University to be Deputy Director and David Munrow, who had been a fellow lecturer and friend of Winterbottom at Leeds Carnegie, became a member of the Council itself. Sports halls and other indoor facilities, including large complexes with halls of 7,000 sq.ft. or more, smaller halls of 5,000 sq. ft., facilities for dance and movement and for other activities such as squash, judo, weight training etc. The Committee included city and county planning officers, Education Department officials from England, Scotland and Wales, and Denis Molyneux from the Sports Council and was to produce a landmark report in 1968, ‘Planning for Sport’ (‘Planning for Sport in Scotland’ was subsequently produced by the Scottish Sports Council in 1972 and similar planning reports were devised by the Sports Council for Wales and later the Northern Ireland Sports Council). ‘Planning for Sport’ was the first attempt at a coordinated approach to planning the new facilities that Wolfenden so earnestly identified as being needed. Although charged with the task of recommending scales of provision for different sizes of community, a measure employed by some European countries including West Germany and France, the Working Party concluded early in its work that regional variation made “national norms” unrealistic. Instead they devised methods which, when supplemented with local data, would enable authorities to assess their own requirements. In the report, the Working Party prophetically stated, “We have indicated that there is evidence of substantial demand, both existing and latent, for recreational facilities, with growing leisure and affluence this demand is likely to increase”. It approached each area of provision separately – sports grounds, swimming pools, sports halls, and other indoor facilities – as each presented different problems. In approaching the task in this way, it was not the belief of the Working Party that each of the three areas of provision should be regarded as separate, either in location or administration; indeed, concluding chapters drew attention to the possibilities, through dual use and joint planning, of linking two or all the categories into multi-sports centres. To reinforce the emphasis on planning and research, the Department of Education & Science undertook statistical research into participation in outdoor and physical recreation. The research report, ‘Planning for Leisure’, was published in 1969 (Government Social Study – K. K. Sillitoe). In the light of its observations on schools, the Department of Education and Science Circular 2/70 ‘The Chance to Share’ was also important and gave more control to local authorities over their own local expenditure, free of government control, for locally determined schemes including almost all sport and recreation schemes. Local authorities could now go ahead in providing facilities, provided they stayed within their overall block allocation of capital investment. So, by 1970 we saw, for the first time in UK sporting and political life, the start of strategic planning processes for sports provision, just in time for local government re-organisation and a period of planning at these local levels. These processes which were to continue strongly at least into the 1990s. In 1970 Sir John Wolfenden had re-affirmed his conviction that an Executive Sports Council was needed. On 4th February 1972, the Sports Council was established by Royal Charter, with executive functions and with an independent Chairman, Dr. Roger Bannister. Thus, a new Sports Council was formed replacing the advisory Sports Council which had been functioning since January 1965 with Denis Howell MP as its Chairman. The Royal Charter gave to the new Sports Council the responsibility of fostering the knowledge and practice of sport and physical recreation therefore ensuring that much of the work previously carried out by the Central Council of Physical Recreation and other agencies would be continued. In June 1972, the staff, and the assets of the CCPR, were transferred to the Sports Council. However, to establish a forum for discussion with national sports, CCPR retained a role. The Scottish Sports Council and Sports Council for Wales were similarly established in 1972, and the Northern Ireland Sports Council in 1973. “In a reference to the grant-making powers of the Executive Sports Council, the Minister with special responsibility for Sport announced in Parliament that the Government’s policy is that the Sports Council should concentrate its grant-making activities on assistance towards National sports organisations, National and regional facilities and multi-purpose schemes to serve larger than local areas. Additionally, the Sports Council would be able to grant-aid specialist facilities, including those for the disabled, and multi-purpose projects where pump-priming would enable local clubs, local authorities, and private enterprise to co-operate in providing facilities giving better overall value for money than piecemeal efforts. The Sports Council would also consider grants for projects of local significance where special circumstances made these appropriate; but that it was for the Sports Council itself to determine its own criteria for making such exceptions within the Government’s general policy that projects of purely local significance should normally be financed locally rather than nationally. The Sports Council, in deciding where grant should be given, will rely heavily on the advice of regional sports councils. It is the intention in the future to establish a rolling programme for the development of facilities and by so doing the Sports Council hopes to develop in co-operation with all providing agencies a planned programme of development over the next few years. In its publication ‘Provision for Sport’ a list of deficiencies of swimming pools, indoor sports centres and golf courses has been produced. Every effort will be made to attempt to make good these deficiencies while at the same time, considering what is required for open-country pursuits and a vast range of other types of facilities that will be required if the quality of living of the community is to be increased. Making good the deficiencies and increasing and improving the quality of living will undoubtedly increase the scope for the appointment of more and more Recreation Managers in every sense of the word and it is encouraging to note the increased interest in training for Recreation Management being shown by so many educational establishments”. Long-term support from the Sports Council was therefore underway for the provision of sports facilities generally and initially for community indoor sports centres. Thus, the Wilson governments had provided new momentum for sport, that largely continued through the Heath Conservative, and then the Callaghan Labour governments of the 1970s.